According to the Ancient Discoveries and most general Divisions of it into Continents and Oceans. 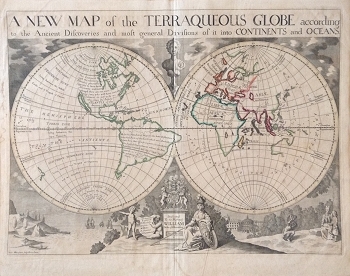 A gorgeous old map by Edward Wells, c.1700, with globes placed against an ornate uncolored background of fantasy figures, sailing ships and a coat of arms. The color is original and displays a prominent image of California as an island. The map measures an impressive 17 x 21 inches.